You will earn 20,044 Reward Points. Earn 1 reward point for every 1 dollar spent. Standard for natural gas operation. Supplied with Gas Pressure Regulator. Automatic Electronic Spark Ignition System. Supplied with cord and plug for 115 volt controls. Typical approvals include AGA, CSA, CE, NSF and ASME. Support Legs with level adjustable feet, flanged for floor bolting. Kettle and all exterior surfaces are a 304 Stainless Steel with a #4 finish. Tilt Mechanism of roller bearings and case hardened self-locking worm and segment gear. 50 psi Steam Jacket Rating. Safety Valve mounted toward rear of kettle to avoid tampering. Steam jacket permanently filled with treated distilled water; venting and/or refilling is not required. 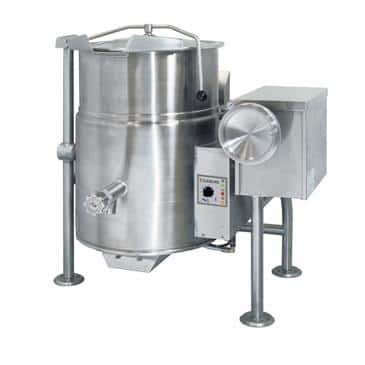 Self-contained gas tilting kettle is easily installed, only needs a gas connection and a 115 volt outlet. Twenty-five gallon model with 90,000 BTU firing rate and 58,500 BTU directly applied to the product. Energy-efficient (65%), high-performance gas-fired heating system for fast heat-up and recovery time. Large pouring lip for easier, faster, pouring. Heavy-duty Rolled Rim design provides strong reinforcement, prevents damages from abuse. Precise, consistent temperature control, less than 1ºC temperature variance (ideal for simmering). Operating temperature range from 145ºF-260ºF (63ºC-127ºC). "Splash-Proof" Solid-State Control Panel for temperature, Low Water Safety, and Power "On/Off" Switch. Accurate L.E.D. Indicators for Heat Cycle and Low Water Warning.